At least nine people have been killed after a fire broke out in a leather factory in the eastern Indian city of Calcutta, police said. Eighteen people were also seriously injured when the blaze swept through the factory, which was located in a four-storey building. Police were investigating whether the leather factory, in a residential area, was legal. 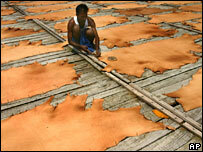 Calcutta is the hub of the leather industry in eastern India. Firefighters fought the blaze for hours and rescued a number of people who were living in the building, reports say. Police official SB Gupta told reporters many people had suffered serious burns.